Ashampoo Photo Commander is an for those with large digital photograph collections. It optimizes, improves and sorts your images and can also create slideshows and upload them to the web. The program allows you to convert images to other formats, rename, print multiple images, rotate, create animations, create screensavers, optimize (reducing the 'weight') and even goes as far as create DVD slideshows. One of the great features of Ashampoo Photo Commander is its ability to optimize digital photographs with just one click; you can remove red eyes, modify color balance, change the hue and contrasts and many other things you might expect in expensive programs like Adobe Photoshop. 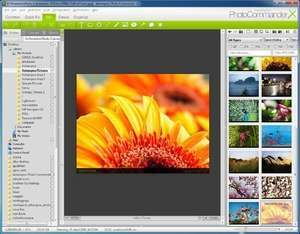 Ashampoo Photo Commander 16.0.5 is a shareware program and can be used as a demo to try the software until the free trial period has ended. A full version of the program is available after the trial period ends. For security reasons, you should also check out the Ashampoo Photo Commander download at LO4D.com which includes virus and malware tests. Additional screenshots of this application download may be available, too. Ashampoo Photo Commander download been highly rated by our users.